This Thanksgiving, families across the country will gather around the television just as quickly as they gather around the turkey. And with good reason: Many people will be staring at beautiful high-definition TV sets. (According to the Consumer Electronics Association, 47% of U.S. households had HDTVs as of July, a percentage that’s likely to increase as the date for analog-to-digital conversion approaches.) But if Eastman Kodak (EK) has its way, many people will be gathered round the TV this holiday season, gazing at family memories in full HD splendor. The Kodak Theatre HD Player’s motion-sensing pointer remote works much like a mouse on a TV screen. This week I tested the Kodak Theatre HD Player, the photo-centric company’s attempt to snag valuable real estate in the living room. This small, black box pulls photos and videos from computers around the house and displays them on an HDTV. It also enables the sending and receiving of photos via Kodak Gallery, and connects to Web-based photos stored on Flickr, Facebook, Picasa, .Mac and others. Podcasts, Internet Radio and updates from news feeds, weather forecasts and stock quotes are also accessible using the HD Player. And it has a terrifically simple motion-sensing remote that works like using a mouse on a TV screen. But the HD Player isn’t all smiles. Its $299 price doesn’t include any built-in storage for keeping content directly on the device. It currently has no way of accessing HD movies or television shows, nor will it work with Macs. In comparison, Apple’s (AAPL) $229 Apple TV has 40 gigabytes of storage, can access HD television shows and movies via the iTunes Store, and works with Macs and Windows PCs. This is important because as budgets tighten in the current economy, gadgets have to prove their value and versatility more than ever. After using the Kodak Theatre HD Player with Windows XP and Vista machines over the past week, I can conclude that this device’s interface shines in its simplicity and is a lot of fun to use. Kodak teamed with Hillcrest Labs to make the player’s motion-sensitive remote and corresponding software, which includes satisfying extra features like images that automatically magnify when the remote control’s cursor points at them and icons that make chirping sounds when selected. The remote itself is shaped to rest comfortably in a hand and has three simple buttons and a scroll wheel. Quick-access memory-card slots for six types of memory cards appear on the box’s front, and two USB ports can connect to digital cameras or USB storage devices. Currently, the player’s software works directly with Flickr, RadioTime (8,750 radio stations) and FrameChannel, which grants access to various “channels” like Facebook, .Mac, Picasa, People.com news and National Geographic. Kodak says it will incorporate YouTube access in January; I got a sneak peek at the interface for this and it looks well-organized. Yet the HD Player’s smart combination of software and remote left me wishing it did a bit more. Photo sharing is enabled only via Kodak Gallery, so you can’t use another Web-based account to share photos directly from your TV. Likewise, a blue light on the box slowly blinks only when new Picture Mail (a message containing shared photos) is received on a Kodak Gallery account, not when new photos are added on other sources such as Flickr Photostreams or Facebook pages. The Home screen of the HD Player shows four categories: Pictures & Videos, Kodak Gallery, Music and Entertainment. Subcategories are where you might guess they would be, for example podcasts are listed under Entertainment. And a tiny Home icon appears in the top right corner of every screen so you can always get Home with one click. The Pictures & Videos category holds photos and videos from a currently selected Windows PC. An unlimited number of Windows PCs can wirelessly pair with the player as long as they have special Kodak software installed on them. But only one PC’s content can be accessed at a time. I toggled between two paired computers without a problem, but would’ve preferred accessing music and photos from both sources simultaneously. 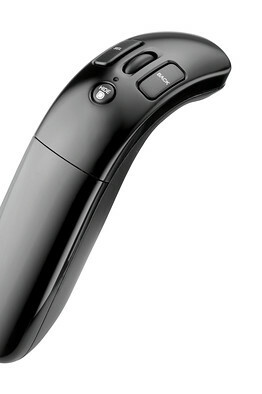 The HD Player’s motion-sensing pointer remote works much like a Wii remote control. Wherever you move it, a tiny leaf-shaped cursor appears on-screen. A Hide button on the remote will hide the cursor while you watch slideshows. The remote’s Back button is helpful; when pressed, it backs you out of one screen using visual effects that make the screen shrink into the TV as if you were moving backward. A play button appears on the first photo in a folder so users can select this icon to quickly start slideshows. Whenever the HD Player receives new Kodak Gallery Picture Mail, or a slideshow is created on a connected PC, yellow alert circles appear on the screen to notify users and a number in the middle of these yellow circles indicates how many new items are available for viewing. Some content on my PCs took a little while to be recognized by the HD Player, including podcasts that I subscribe to on iTunes. When they did show up, both audio and video podcasts played without issue and on-screen playback buttons made them easy to control. The HD Player uses your photos to create automatically generated slideshows, called Picture Chronicles, once a week. These Picture Chronicles use up to 50 photos from the same time of year in all of your folders, for instance grouping all Thanksgiving photos together from the past five years. Kodak has plans to make its player Mac-compatible in the future and also hopes to add other partnerships with new types of content following its YouTube announcement early next year. The Kodak Theatre HD Player does its job well, bringing photos and videos that might otherwise live only on your PC to your big screen HDTV. For the holidays, this device could be a real plus. But Kodak has some work to do to make this a more useful Web-connected tool.